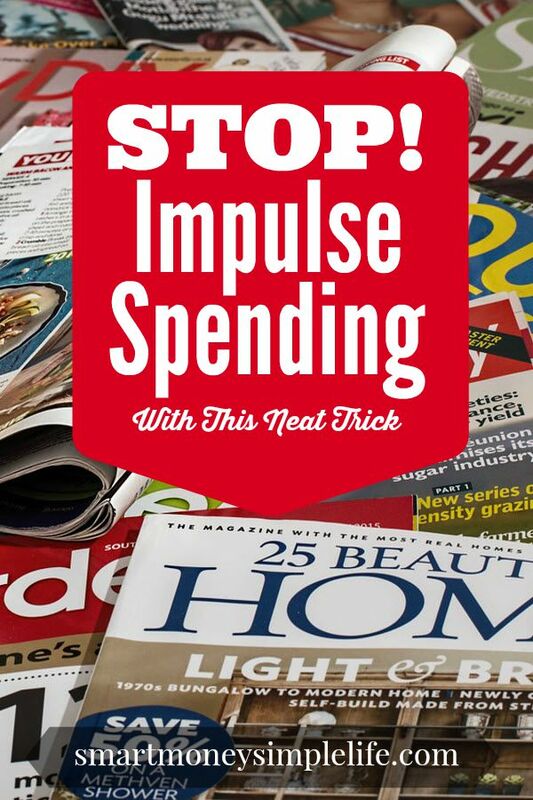 Impulse spending is the biggest threat to maintaining a successful budget. In today’s world we’re surrounded by constant temptation. Everywhere you look there’s a bright shiny advertisement either playing on your fears or tapping into your deepest desires. Buy this and you’ll be more attractive or look successful or slimmer or… You get the picture. Advertising executives and creative directors get paid big bucks for a reason: they are very good at getting you to buy what you don’t need and didn’t know existed until you saw their billboard or commercial on TV. Trying to stop impulse spending by denying yourself is one way to keep your money in your pocket but you can’t live in a cave forever. Figuratively or literally! At some point you have to live in the world again. Finding a way to manage or preferably stop impulse spending is a foundation step to taking control of your budget. You might not think you have a problem with impulse spending but if you track your spending for few weeks, you’ll no doubt notice patterns emerging. It could be as simple as buying a treat when you go to the grocery store or it could be more substantial like a new piece of clothing or DVD or shoes on payday. If it’s a purchase you made that you didn’t plan for, budget for and make a considered decision about; it was an impulse purchase. When I was in my 20’s I had a real problem with impulse spending. Especially the bargain kind. It took me a while and a maxed out credit card to discover that I was impulse shopping my way to financial oblivion. Once I accepted the reality of my impulse spending habit, I had to figure out a way to break that habit. That’s when I stumbled on this neat trick: A memory trigger card. This trick can work for anyone regardless of why you want to break your spending habit. Back then, I used it to help clear my credit card debt quickly, now I use it to focus on paying down my mortgage. You could also use it as motivation for adding to your investment accounts or saving for something special like a trip overseas. Crunch some numbers. Jump onto a site with financial calculators. This is my favourite mortgage repayment calculator. Enter in your outstanding balance and the amount you normally pay per week, fortnight or month and it’ll show you the time it will take to pay out your mortgage. Adjust the payment amount and frequency to weekly. This makes it much easier to see how a small amount each week can have a huge impact on the length of your loan and the interest you’ll pay. Now add $20 to that weekly payment. How many years does it save you? How much interest will be saved? Write it down. Now add $40 to that weekly payment. Then $60, $80, $100 and note down the years and interest saved. What I did, and I’m sure it will help you, too, is to then transfer that information to cards, Post It notes and slips of paper that I put in my wallet, on my car dashboard (so I wouldn’t succumb to drive through temptations), on the back of my closet door (so I wouldn’t automatically think I needed new clothes when I couldn’t figure out what to wear), on the fridge… you name it, my memory trigger was on it. Can you save an extra $20 a week if you’re no longer at the mercy of your impulse spending habit? Maybe you could save more? If you add the money saving tips from 10 Painless Ways to Save $100 Each Year or the tips in 15 Frugal Living Tips – To Get You Started you could very easily add an extra $100 to your debt reduction or savings plan. Isn’t it worth putting together your own memory trigger to help stop impulse spending? This is a great motivator that I never thought of doing before! Even though I know I’m saving every last penny extra to put towards debt, I never really thought to check how the little things add up to keep myself motivated! When you’re putting several thousand dollars towards debt each month, it’s easy to say- oh but this $20 doesn’t matter… But clearly it does! Yes, indeed! It ALL matters. And, those little purchases can really add up. I am best at avoiding impulse purchases when we are really busy. It’s pretty easy to avoid any unnecessary spending when you barely have time to get out of the house!